I have a bone to pick with flash ads and flash pop-ups. First, best practices in Internet have basically blocked pop-up windows which was probably the best thing they could do at that time. But now, advertizers are resorting to using flash pop-ups which come up while you are browsing, effectively obstructing vision of the actual website! And they also show up just when you decide to click a link – and you end up clicking the damn thing and you are directed away from your intended destination. Second, most of these flash pop-ups have that dumbfounded “roll-over” feature in them which set off when you accidentally set your mouse on them and they set off the whole saga that is their advertisement. And you cannot even undo that action because the whole thing is unfurling and making your computer go weird. Third, some of these have sound enabled on them which scream into your speakers (that ever-irritating “Congratulations. You have been selected to win a free iPod/iPhone/Wii/space ship”). Aaaaargh. It’s so sad that even NEWS websites are doing this. Especially some Indian NEWS websites. 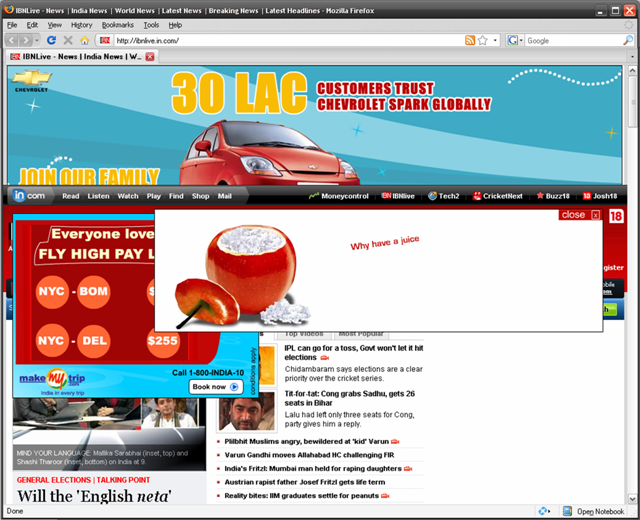 IBN-Live, for example, has recently (been a year or so) started showing flash pop-ups and I happened to take the above screenshot yesterday. How on earth do I unearth the news from this? How am I even supposed to read anything on the screen? More than half of my viewing screen is taken up by ads! Rajdeep Sardesai, if you are reading (fat chance), I like your channel, but your website needs psychiatric help. Too many ads. On an average, you run over 10 ads per day on your home page. I know you are trying to sell news, but this is crossing limits! I know people who have stopped visiting your website because of how many ads you keep on the screen! Take heed, and please clean up your site! that screen shot just says it all.. i also get irritated with these crazy pop-ups.. another thing about news sites i don’t like is a huge ad inset in almost any article you open up to read, somehow dilutes the article.. we will have to swallow more of such pushy advertising in days to come..
Gauri – I am glad you agree! Yes, I do get irritated with that inset. They are so big that I sometimes think that the article ended abruptly. But, NO! And the adjective you used is apt – PUSHY. Akanksha – First of all, welcome to my blog! And yes, that DOES sound like it needs to be researched. I think all ads have lost “creditability” at the top and sides. I suppose something that *might* work is that if websites show one box which says “There are 4 ads that are relevant to this page”. People click it and see it at will, rather than it being imposed inflicted upon you. Oh this is good.. I am in fact working on how to effectively place “relevant” ads on webpages so the users end up clicking! usually most of the users have started developing a blind spot towards the banners on top and the text ads on the right panel. lets hear more frm koke guruji! It does get irritating many times. Like you said Koke, I do end up clicking on the ad that magically unfolds just as I point my cursor on the link I wish to visit! I think they have some inbuilt invisible sensors that make the ad open wider just as we start moving our cursor on the screen!!! Please make Rajdeep Sardesai hear you somehow. You can use a FF plugin called AdBlock Plus. 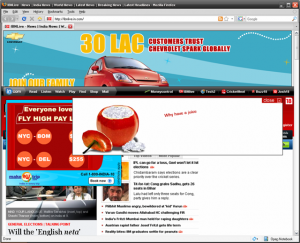 It very effectively and silently assassinates almost all ads, including Flash.